Super Mario Odyssey has given Switch the sales boost it needed to pass the two million consoles sold marker in its native Japan. Last week, Switch sold 133,094 units, with the bulk of that figure apparently thanks to the Super Mario Odyssey Switch bundle. Last week also marked the biggest delivery of Switch stock Nintendo had issued to retailers in the last four months, meaning there were more consoles on offer than normal. According to Famitsu, Super Mario Odyssey sold 511,625 copies during its first three days on sale in Japan. 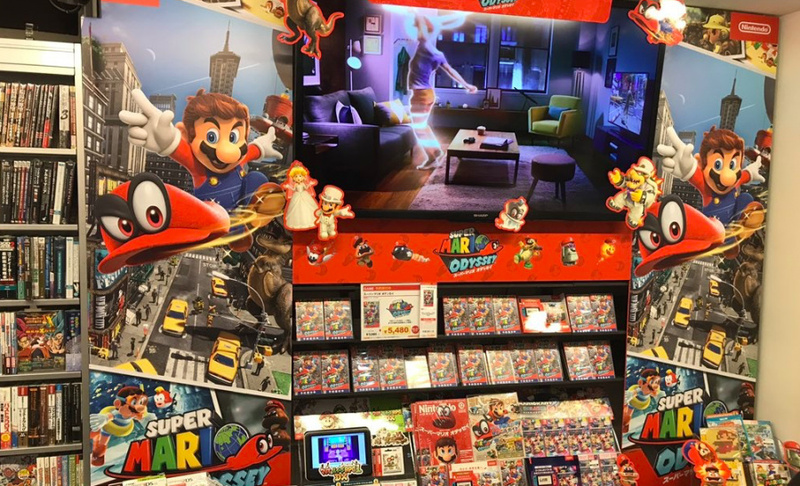 These sales include game-specific download cards and the Switch Super Mario Odyssey bundle, but not copies purchased directly from the Switch eShop. It would appear that the entire shipment of physical copies sold during the first three days on sale, so the total figure could well have been even higher. Anyone shocked by this? Other than the naysayers and the 3rd party devs that didn't jump on the bandwagon? Great. It's a little early for Media Create sales. They'll be out in about 15 minutes. Can people now please stop talking about Switch "shortages"? It's a load of nonsense. NintendoLife you lose a visitor to PushSquare as they still publish the whole sales table. Some people are interested in the whole story you know! @datamonkey I post them in the Switch forum. They're not out yet. Media Create are generally more reliable than Famitsu. Edit: Scratch that, they're out, I'll post them soon. @SLIGEACH_EIRE yeah because the big stores are still doing lotteries for s..ts and giggles, amirite? This week's Media Create sales for Japan. @SLIGEACH_EIRE Great to see the boost in hardware sales with the release of Odyssey. Truly, many people want to get their hands on this game! Surprising turn out by Ark. Didn't know if was popular in Japan. Awesome I really love it, so good to see Nintendo doing well again. You still can't walk into a store in Tokyo and buy a Switch without a great deal of luck. I've been on the search for a friend since launch, and only found the one I bought for myself. Just gotta say that I love all the amazing outfits you can buy in-game or get from scanning amiibo. Wedding dress Mario is hilarious. I'm really happy I went with the download for Super Mario Odyssey. I'm playing this game so much, and Fire Emblem Warriors (which I got physical) so it's nice not having to swap the game cards constantly between the two. LOL! 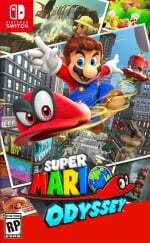 Mario Odyssey is the fastest-selling 3D Super Mario game of all time by a wide margin. It is the 3rd fastest-selling Super Mario game of all time in general (behind NSMB DS/Wii). This was also the biggest week of Switch sales since launch. Well-deserved. The game is great, as is the system. @SLIGEACH_EIRE who to believe. The guy sitting in Ireland or the person who is actually in Japan and can speak on first hand experience that finding a switch is tough work. Yeah it's really not a tough decision. @SLIGEACH_EIRE "Can people now please stop talking about Switch "shortages"? It's a load of nonsense." I have no idea why you keep insisting on that. The shortages in Japan have been extremely well-documented, with articles on any number of dedicated websites. Nintendo clearly holds back some hardware stock ahead of major game releases. So, I suppose, there is some truth in the line that Nintendo is artificially reducing the supply of Switches into the market. Of course it's on a very modest level and over very short time frames. Also, going by Media Create sales figures, the Switch HAS NOT surpassed 2 million sales in Japan just yet. Switch sales as of last week stood at 1,870,759, so combined with this week, it has sold 1,997,460. I fell in love with Super Mario Odyssey yesterday. The game is brilliant and crazy fun. It should sell a ton of consoles more. @SLIGEACH_EIRE Thanks for the charts. Those Super Mario Odyssey figures are excellent - but roughly a third down on Splatoon 2's launch sales. If they literally sold every physical copy that shipped, then I guess Nintendo couldn't have done any better, but it surprised me. I mean, Splatoon's popularity in Japan is patently obvious (still the top-selling non-new release), but I'd have thought SMO would have matched it. On the other hand, SMO will presumably have an even longer tail than Splatoon 2 (if that's possible). Good for Japan...I still haven’t gotten mine, Amazon lost my shipment and is resending it to me this week. It’s been a sad week of waiting and disappointment. @SLIGEACH_EIRE That is very weird because when the official numbers came out last Monday, the Switch already sold 1.95 million units in Japan till October. I am curious about the next two months. Loads of games (even if they are ports) on the Switch and the holiday period! Edit: Thank you for the charts, really like to see those every time. You are quite entertaining this morning (it’s morning in LA). Carry on! @ricklongo I said "NOW". The shortages were in the past. @SLIGEACH_EIRE There are still reports from people in Japan that's not the case (in this very comment section, even!). I'm sure things are getting better, but it seems it's still tough to get a Switch in Nintendo's homeland without taking part in a lottery or something like it. In other parts of the world, things seem much better in that regard, though, which is welcome news. Weren't you denying the existence of Switch shortages even in the past?? @SLIGEACH_EIRE Are you in Japan and you can tell if there are no shortages when people that live in Japan insist that there are? How further can you go with all these ignorant comments of yours. Cool off a little. @SLIGEACH_EIRE Yes there are shortages - just because BIG shipments come in, doesn't mean disqualify there being a shortage. They sell thru quickly. Even in the US, you can find them way easier now, but if you see them at retail one day, the next they may be gone. Then the following week they may receive none at all until the following week. That defines shortage, supply that fails to meet demand. Surplus would be if there was no sell thru, or an extremely slow one. Just buy a Switch already and stop acting out in jealous baby rage on here, lol. "Thanks To Super Mario Odyssey Fever"
I don't know about that. All I picture in Japan is a lot of people buying a Switch, even the one bundled w/ SMO, and going home to play Spaltoon 2. I feel like even if Mario wasn't due out for months in Japan they still would have sold that many consoles just by virtue of them being on shelves. Not that Mario is a detriment by any means, I'm just pointing out that Switch didn't need a boost, demand was so high in Japan the game didn't matter as much as the Switch just being in stock. Obviously Japan was holding back Switch stock that they had already bundled w/ the game, or game code as it were. Seeing the game sell well is nice though. JJ I know it's close. @SLIGEACH_EIRE Even if the Switch sold 1 million units a week, there could be stock shortages if 2 million people wanted to buy it. Selling well doesn't mean that there are no stock shortages. Stock shortages happen when the demand outstrips the supply. It’s worth noting that the Wii U sold just over 3 million systems during its lifetime in Japan, meaning the Switch has already sold two thirds that amount in eight months. At this rate, it’ll blow past the total Wii U install base in just a year. @thesilverbrick The Switch sales are actually more or less in line with 3DS launch sales at the moment, and possibly even beyond those. Think we can just forget about those comparisons with the Wii U at this stage. @kobashi100 obviously the guy in ireland! The ignored prophet of the switch's doomed fate! @thesilverbrick Not just that, it could possibly overtake the PS4 in Japan if it keeps going at the pace it's going. @Krull @WiltonRoots It’s obvious at this point that it’s not even fair to compare the Wii U and Switch, but when I see positive sales numbers like these, I can’t help but comment on them and drawing positive comparisons, having sat through nearly 5 years of Wii U misery. It’s refreshing. @SLIGEACH_EIRE New Leaf just refuses to die. I've heard that physical copies of Mario Odyssey has actually gone out of stock in Japan due to the high demand, resulting in higher-than-expected sales of the download card version of the game. I don't think Nintendo expected Mario Odyssey to sell 40%+ more than the previous fastest-selling 3D Mario game. @SLIGEACH_EIRE I live in Japan. There are still Switch shortages here. I have yet to see one on a store rack. I hope this will change now that there aren’t really shortages anywhere else, but now Nintendo has to really stock up in Europe and NA with Christmas coming. I wish Nintendo (and other publishers) gave out exact sales figures on a regular basis, including digital sales. Right now no one has any idea how high sales are - yes physical copies obviously give a good indication, but digital makes up a very substantial part of sales these days, which will only increase as time goes by. @WiltonRoots thats not that hard PS4 total sales in Japan is near 5,5 million units. In the next 2 years Switch should surpass it sales keep going strong. True, in fact it took a long time for PS4 to overtake the Wii U in Japan. Because it's such a westernised console it's really struggled to get a foothold in its home country.